Checking out the Guardian online, their fashion editor, Jess Cartner-Morley roadtests Summers big trend-the trophy or statement jacket. Click here to see her mini video review and read her recommendations on what jacket styles are winners for this season. I'll definitely be wearing my Chanel jacket that I purchased last year, I can't wait!! Oh, Sharon. I enjoyed very much your position. I fall in love your Chanel jacket (good bargain) and I envy it. :) The video is superb. All trophies jacket appealed to me. Which one are your favourite? Hi Janet-the M&S one on the video is a very good buy indeed, stylish and value for money! thanks for your lovely comment! great job once again on being thrifty and super chic! I'm still so excited about that jacket. Hi ren-thanks for your lovely comment!! Hi wendy-that was such a fantastic, memorable day and our purchases were unbelievable!! In few past months I didn't saw sooo cute jacket! Hi fashion moment-thanks my dear!! you have to do a post when you do. fab jacket. Hi savvy-sure will, thanks my dear! such a great jacket and that style is back in a big way this season, lucky thing! I remember that jacket! Its gorgeous! Its beautiful..quite like spring today..here..maybe soon you'll wear it. each time you post your chanel jacket I feel so jealous!!! you were so lucky finding it! Hi everyone-such lovely comments, thank you all and they are much appreciated! 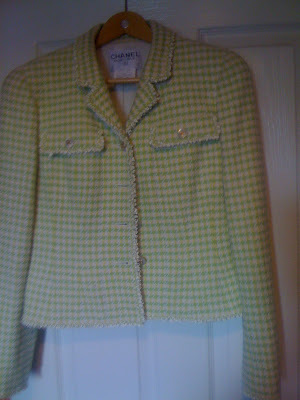 oh my, i'm lusting after your Chanel jacket--and vintage! how fabulous!! Your jacket is just fab, and nice video indeed. What are you waiting for... this jacket is a baby! crying to go out! Hi tanya-thanks so much my dear! Hi the seeker-yes, I liked the video too, thanks!! Hi Eri-so lovely, thanks my dear! OH SIGH... And I imagine you thrifted it for a song too! You lucky hunter, you! Hi MissAmyShops-the full story is under my label of 'Mrs Stings designer Sale',I was lucky to get it for £100! !